My father just moved to Keystone Cedars. He called me the other day, and talked my ear off. He could tell me enough about his spacious apartment and how busy he was. He told me he really loves it in his new apartment. The staff made it easy to move. And they told me they just love my Dad. I would recommend this place to everyone. We appreciate your kind words. Thank you for choosing The Keystones of Cedar Rapids! We love Keystone Cedars. It's beautiful. Trish was very accommodating and friendly, and we exchanged lots of phone calls. She was always quick to get right back to me and answer our questions. It was really nice working with her. We got a tour one time while the residents were eating, and they were playing bingo the next time we visited. Everyone seemed happy there. Thank so much Angie. We are so thankful for your feedback. We love what we do at the Keystones! Keystone Cedars' staff was very helpful, excellent, and answered all my questions. The cafeteria had a wide range and variety for the residents. It was a very nice place. The grounds were very nice. They had a swimming pool that was accessible with a whirlpool. The rooms were larger than in other facilities, and very clean. The residents said the food was excellent and well-balanced with fruits, vegetables and grains. They had everything that you should have. The decision of where to move a loved one can be quite daunting. This process, however, was made so much easier after visiting Keystone Cedars. It was a unanimous choice once we had seen the grounds, saw the accommodations, tasted the food and had talked with the staff members. Everything about Keystone Cedars is amazing! Mom loves her apartment! She loves to show it off. It did not take long for her to refer to it as "home". I enjoy dining there when i can because the food is second to none. Great choices every day. And the aides and other staff members ~ they are kind, compassionate, patient and you can tell they love their jobs. The are dedicated to providing friendly and efficient care. Activities ~ they certainly have them! The activity directors are genius at coming up with things that are interesting, fun and engaging. They have done flower arrangements, multi-media art pieces, painting, coloring. They play games a lot. One day they had "glamour shots" ... complete with accessories! At least once a week they get in the van and go for a ride -- just to get out and see the world for an hour or so. And they are always bringing people in the entertain or educate. Once a week we get together and say the rosary. There are movie days - complete with some of the best warm popcorn you will ever have! Special days are celebrated in unique ways ~ and family members are always encouraged to join in. Their goal must be to make every resident feel relevant, give them opportunity to socialize and keep them engaged. They certainly succeed at all. Bottom line is: they truly care. It is sort of like they become part of the family. My mom has shown herself to be quite the artist. She raised seven kids, so she probably just did not have the time to do anything like what she is doing. But she loves the projects. She makes bracelets and does a lot of drawing and coloring and painting. I went into her room about two weeks ago. She had just done 2 paintings that were all black on off-white paper. They were very abstract. She did not seem pleased with them, but then I asked if I could have them. She reluctantly agreed, warning me though that they were not that great. I matted and framed them. I gave them to one of my brothers who lives far enough away that he does not get to see all she does. He was very touched. It was a one of a kind gift that she had done just a week before I brought them to him. He will proudly hang them. And when I showed her the picture of how they turned out and him holding them, she was thrilled and so proud. The point, I guess, is that the fine folks at Keystone know how to encourage and engage the residents. Where we were reluctant and apprehensive going into moving her, we are now confident that we made the best decision, and that she is in the best place. She is socializing. She is learning. She has friends. And she is so well cared for. It is not all about our piece of mind. The most important part is that she loves it there. She is blossoming before our eyes. And that is worth everything to us. And that is a testament to the people that make up the Keystone Cedars staff - though I hesitate to call them that. They are like family. They are an excellent group of people. And they are fun. We feel so fortunate that we made the decision we did! She is very happy! Thank you for the review! We are so glad you chose Keystone! No matter who you meet at Keystone, there is a cheerful smile and a willingness to help in what ever way you need. This would be a far better world if we could just spread the love found at Keystone to the far corners of the globe. I feel very fortunate to be at Keystone! We are so fortunate to have YOU here Joyce! We picked out Keystone Cedars. My mother knew two ladies there who were very happy with the facility, and I think that made a big difference. She likes the rooms and the activities. They visited different places, like Walmart and to the grocery store. They have a library and play bingo. We ate lunch there, and she liked what they had. They had a choice of fried chicken or Salisbury steak, lettuce salad, or a soup, and dessert. If you didn’t like their choice of two entrees, they had a chef salad or you could order a hamburger. There was a lady that took us around who was very nice, very pleasant, and answered all of our questions, so we were happy with her. She gave us all the information. We’re very happy with Keystone Cedars. My mother likes it. So glad your mom enjoys living at Keystone! Keystone was very nice and probably one of the better ones we’ve seen. We only really met the executive director. We spent a little time with her and she was very helpful. And she used the written materials that describe the facility well. We toured a typical apartment and also the memory care unit. They were very nice and nice sized; probably more the one-bedroom as opposed to the studio. The studio looked too much like a dormitory room and there’s not much to it, but the apartments were like a two-room area, one being the living room, kitchen area, and then the bedroom area and, of course, the bathroom. They seemed satisfactory for a person to live in. We saw some very nicely decorated areas and some nice residents who would probably be good friends to my mother. They did have activities that if someone is socially inclined there would be things to do as well as opportunities to leave the facility for shopping and things like that. Keystone Cedars is a beautiful facility, I think it’s fairly new. The rooms were kind of small. The price was more expensive than the other facilities we’ve visited, and so we were less impressed with that. The dining room was just OK. They have a shuttle to take residents to places. I would recommend it to my aunt, who is wealthy, because this is the perfect place for her. She would really like it. It seemed a little more upscale for my mother. Thank You for your review. All feedback is appreciated and welcomed. The lady showed me a couple of rooms at Keystone Cedars. We didn’t walk outside but she showed me the walking area they had available outside. The sizes were good, and they had a nice dining area and nice options for meals. They were all very good showing me around. That was a really nice neighborhood there, and had little, private outdoor spaces. It’s somewhat secluded, and yet there was a lot of things around it. It was very nice, kind of back in a cul-de-sac so that it was private. It was very nice and pleasant to look at. Everybody was very friendly. I moved mom to Keystone Cedars Assisted Living. The place is clean and nicely appointed. It's a very comfortable place to live in. I felt that it's a place that she would enjoy living in. Apartment: clean, quiet, very comfortable. Fitness room and pool: very clean and well-maintained. Activity room, Library, Clubhouse: very clean and comfortable. Food: excellent selection of drinks, salads, entrees, side dishes, and desserts. Residents: all appear happy and friendly. Similar to a cruise ship experience. Staff: open, pleasant, caring, and helpful. There is not enough room here to write about how fantastic "Cedar" is. I have nothing but praise for the staff and the care my dad got when he lived there. He loved his apartment and everyone there. Need assisted living for a loved one? Keystone Cedars is the place. Thank you Joy, for allowing us to care for your dad at Keystone. We value your caring words! Moving my mother to an assisted facility was difficult for me. Now I know it was the best move. Cedars is inviting, well run, and friendly. Residents are a top priority for all staff. Wonderful care, great meals, varied activities and services. We appreciated you taking time to share your experience with others, and thank you for letting us care for your mom! When it became necessary for my mother to live in an assisted living facility, the idea was met with resistance and negativity. However, the country-like view from her room, the decor of the facility, the friendliness of the other residents, and the personal caring of the staff had her calling Keystone Cedars "home" within a short time. We experienced peace of mind, knowing she was in a physically safe environment that provided many opportunities and experiences that enriched her life. We are so grateful for the high level of competence in management and medical personnel. On a personal note, we have appreciated the availability of a guest room when we visited from out of state. Thank you for your kind words! We are so glad we were able to help your mom feel at home! Delightful living place, clean, and very good staff. Good food, well served, and lots of entrees to choose from. Excellent activities available and very homey atmosphere. Happy to be a resident. It makes us happy to know you feel at home! 5 star services, facility, residents, and staff. Wonderful swimming pool, and good food with 5 selections. Frequent entertainment with a nice variety. Good place to call home. It's very clean and comfortable. Good and caring staff. There are many things to do and nice entertainment. Needs improvement in food quality and serving temperature. Thank you for your review! We understand the quality of food is of utmost importance to our residents. We would love to discuss the specifics of your concerns with you in order to maximize the experience at Keystone! When I visited Keystone Cedars, I was happy with what I saw there. I believed the head of the nursing department was the one who gave me the tour. We talked for about an hour and a half about what they did and what was best. They had very nice units. There were activities but I did not see any entertainment during my visit. However, I looked for a place with memory care and nursing care because it won't be long before my wife would need the nursing care. Nonetheless, I would recommend this facility to others. Thank you kindly for sharing your experience with us. We offer a full schedule of activities for our residents. The monthly calendar can be viewed on our website at www.keystonesenior.com . My wife and I visited Keystone Cedars and we liked it. It is clean. The staff was very good, very cordial and inviting. They wanted us to stay there but the place was carpeted. It would be nice if they had non-carpeted floors and bigger rooms. The facility seemed to be okay. It was clean everywhere that I saw. The staff was friendly enought, but didnt seem extremely enthusiastic. THough, how could you be when you are surrounded by death. The amenities were good enough. They also had daily activites the member could go to in order to interact with others and get some mental stimulation. The food seemed really cheap for how much my parents were paying to keep him there. In his condition, Im sure he wasnt affected by any conditions in this place. Thank you for your comments. Keystone will continue to strive to provide the best quality care to our residents. They go through Relias training, two- hour live dementia training and a lot of our monthly staff meetings are dementia specific. A total of 12 hours per year. Describe the overall population of assisted living residents at Keystone Cedars. What is their average age? What are their favorite things to do? 80 to 85 years is the average age of our residents. 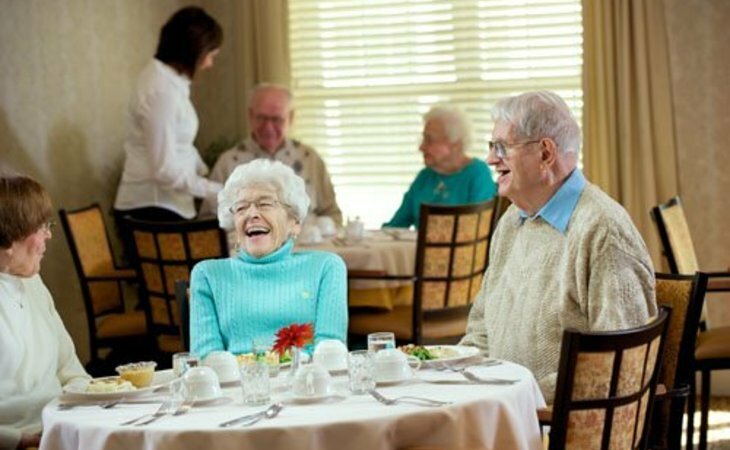 What our residents love to do varies for sure but.. some of their favorite hobbies include bridge, book club, bible study, happy hour and of course join their fellow neighbors in the restaurant for all three meals that are prepared by Chef Dustin and his culinary team. What programs or activities does Keystone Cedars offer to enrich residents' well-being? What places are near Keystone Cedars or within walking distance for assisted living residents to enjoy? What transportation services does Keystone Cedars offer to assisted living residents? What makes the chef or dining program at Keystone Cedars exceptional? What kind of menu can assisted living residents expect? What safety features or security measures does Keystone Cedars offer to assisted living residents? We do have security cameras in our buildings as well as secured doors. How does Keystone Cedars keep residents' families informed about their loved ones? By way of phone, mail, emails, care conferences. Our operational staff, as well as the nursing staff, work very closely with our residents and their families to keep them informed of any changes that may occur or affect the resident. What is the care staff-to-resident ratio at Keystone Cedars during daytime and nighttime hours? If Keystone Cedars accepts dogs or cats, what indoor/outdoor areas can they enjoy? What safety features or security measures does Keystone Cedars provide to protect residents who wander? What programs or activities does Keystone Cedars offer to keep residents engaged? How does the staff engage residents' long-term memories? Our Director of Nursing does the initial assessment prior to move in. We then have the nurses do a 30 day, 90 day, and annually. If there is a change of condition between any of these scheduled assessments we will do one at that time as well. What techniques does Keystone Cedars use to support memory care residents during mealtimes? How does Keystone Cedars keep residents' families informed about their loved ones' health? This takes place from phone conversations, family care conferences etc. The relationship the residents/families have with nursing is very close. Describe the neighborhood around Keystone Cedars. Is it located in a residential neighborhood, a business district, a rural setting, or other type of locale? We are surrounded by homes and businesses, so a little of both. Is Keystone Cedars affiliated with a hospital if more care is needed? The Keystone Cedars is conveniently located on the northeast side of Cedar Rapids. Just a short drive away, you’ll find shopping, restaurants, churches, medical services and more. Choose the perfect level of care. Live independently at Keystone Place, while knowing you can turn to Keystone Cedars down the road. Keystone Cedars provides both assisted living and memory care services. Living at Keystone Place Independent Living is like being at home- only better. Our large apartments include full kitchens, laundry machines and your own spacious patio or deck. Dine at the restaurant, sit down with a good book in the library, stay connected to family and friends in the computer room, exercise in the fitness area or relax in the swimming pool and Jacuzzi. Other services provided include a full-service salon, transportation, housekeeping and engaging scheduled activities. At Keystone Cedars, you'll continue to live independently while enjoying peace of mind. Our assisted living community offers health care services tailored to you, provided by 24 hour staff. Keystone Cedars offers multiple levels of care, emergency pull cords in each apartment, housekeeping, maintenance, transportation to doctor appointments, three meals a day and a full calendar of activities. Keystone Cedars also offers a memory care area located in a comfortable and secure area with just fifteen apartments, ensuring specialized and attentive care. At Keystone Place and Keystone Cedars, there are many activities at your fingertips. You'll live life to the fullest among staff and neighbors who will come to feel like family. While enjoying a wealth of amenities, you'll know your health needs will be supported into the future. What should caregivers and potential residents know about Keystone Cedars?